Goodness, the summer holidays really do feel like a distant memory. Anyone else finding it really hard to get back in to the routine of school, nursery and after school activities? And the school run…I had forgotten how long it takes to get four children fed, cleaned, dressed and out the door (well one can do most of that himself, but don’t underestimate the amount of shouting it takes to get it done –who said kids are easier as they grow up?!). The last week of the holidays was spent finding, buying, washing and labelling uniform, shoes and all the other bits of kit – and now we pretty much need to re-mortgage the house to pay for it all. Anyway final bits of sorting done, coats located and dusted down, shoes lined up in the hall and umbrellas at the ready. So time for the packed lunches…. They may seem similar, but packed lunches are a whole different ball game to a summer picnic – children are eating them every day so they need to be healthy, nutritious and they need to provide some variety to stop the little ones getting fed up with them. Cocktail sausages and cake just aren’t going to cut it on a daily basis. Away from my normal role of cake provider and connoisseur of all things sweet and sugary, I thought I better put my sensible Mum hat on and have a think about how to give my children a decent packed lunch with a yummy but healthy treat in it. For inspiration I’ve had a peek around the internet, chatted to friends and put together the following ideas. 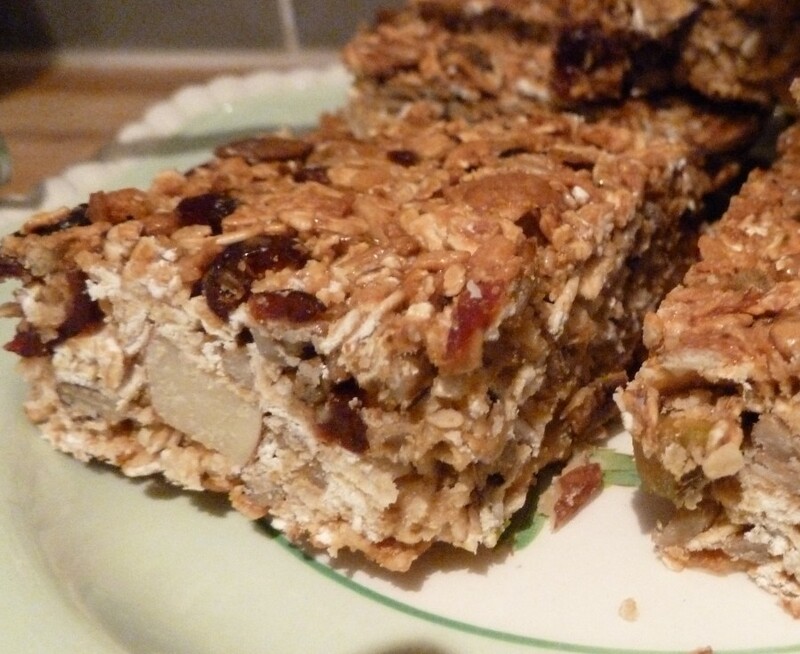 I’ve also given the lovely Nigella’s breakfast bar recipe a go… it’s delicious and full of seeds and fruit…a great alternative to chocolate and crisps for a lunchbox…recipe and photos below. Bread sandwiches can get a bit boring, and some kids won’t eat an ordinary sandwich, try using pitta bread or wraps for a change. Get a cracker selection box and let your kids pick two each day. Try and go for wholemeal bread products where you can. Instead of a sandwich include pasta. Eating pasta for dinner? Save a portion for the lunchboxes the following day. Chicken and pesto works well. Give them a treat every now and again – maybe on a Friday – pretzels or similar are a good low sugar alternative to crisps. Cut the sandwiches using different shaped pastry cutters to keep it interesting. If sandwiches are just not going down well, no reason why you can’t put bread and butter in the lunch box and some cooked chicken or chunks of cheese. Include a piece of fruit but don’t just stick to an apple – try chunks of pineapple, slices of melon or quartered oranges. Make is fairly easy for them to eat. If you have time make a fruit salad – squeeze a little lemon juice over it to help prevent it spoiling before lunch time. Include some nuts, seeds or dried fruit in a small paper bag or sandwich bag…my children’s preference is for walnuts, try different things, there is probably something they like. And as for Nigella’s recipe…she describes it as ‘milk and cereal in a bar form’, so go for it…you could enjoy one with a cuppa whilst you wish you were back on summer holidays (or not!). Preheat the oven to 130c/gas mark ½ and oil a 22x33x4cm baking tin. Mix together all the other ingredients and then add the warmed condensed milk, using a rubber or wooden spatula to fold and distribute. Spread the mixture into the tin and press down with the spatula or your hands. Bake for 1 hour, then remove from the oven and, after about 15 minutes, cut into four across and four down to make 16 chunky bars. Let cool completely. For an even healthier version replace the condensed milk with soy milk and a little brown sugar. Use any dried fruit and seeds you like.